Why not give someone a "HANDMADE" Valentine once again? Remember those days in elementary school where we glued and cut our way into someone's heart? What's stopping us now? Why must we rely on others for giving the love that we feel in our hearts? 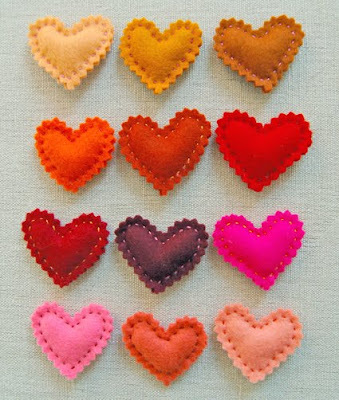 because these hearts are just wonderful! I know, I'm getting carried away with the Purlbee.com but I have to say, they are just fabulous! 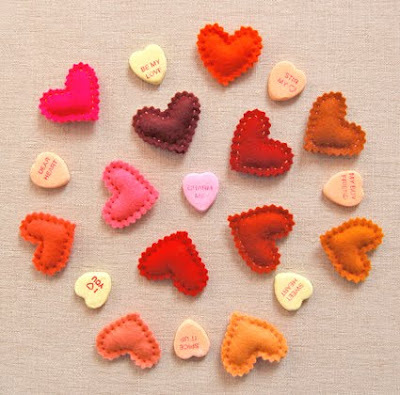 Check out this TERRIFIC small Valentine's Day Tutorial from Molly's sketchbook! These are just wonderful felt pins that really need minimal supplies. easy explanations that they supply. I just can't get enough of all the items that can be created with all these supplies at one's fingertips. I just wonder, how much damage I could possibly do to my credit card if I actually entered their brick & mortar; because I KNOW what damage I've done just by the click of my mouse.